ANNUAL HERB: Appears quickly after summer rains commence and begins flowering after a few weeks. The plants ramble weakly across the ground forming mounds of flowers. Check the vast fields in the photo at Firefly Forest. LEAVES: Dark green, compound leaves with an even number of leaflets are alternate on the stems. Stems are covered with stiff, bristly hairs. RANGE: Upper Sonoran Desert particularly along the southern edge where the summer rains are more predictable. Texas to California. 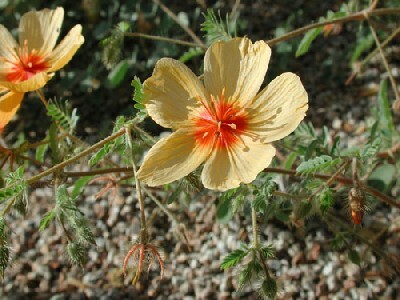 FLOWERS: Bright orange, five-petalled with ten stames. July to Sept.